Bring the grated zest of 2 of the mandarins and the juice of all the mandarins (approx. 450 ml) to the boil with the lemon juice and half the preserving sugar, stirring constantly. Boil fast for approx. 3 mins., skim off the foam if necessary. Add the remainder of the preserving sugar and boil for another 3 mins. or so, stirring. While still boiling hot, pour the jelly through a sieve into the clean, warmed jars, to just below the rim. Seal immediately. Upend on an insulating base and leave to cool. On a surface lightly dusted with flour, roll the dough out in batches approx. 2 mm thick, cut out the cookies to a diameter of approx. 4 cm, prick as many holes as you like into half the biscuits, transfer to baking trays lined with baking paper, chill for approx. 15 mins. Bake for approx. 8 mins. at 160°C (fan). Remove from the oven, cool on a cooling rack. 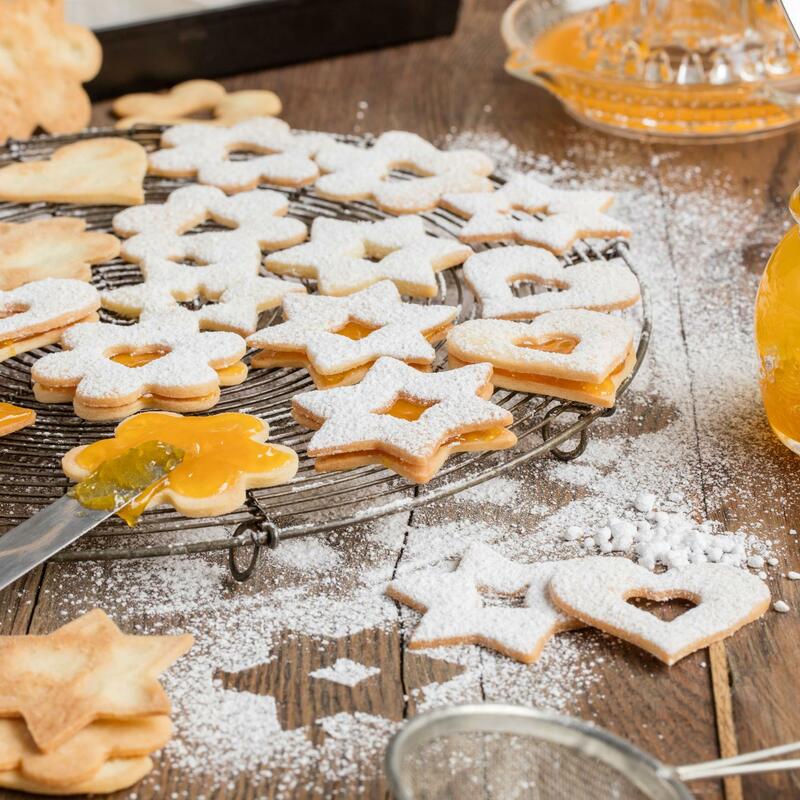 Stir 150g of mandarin jelly until smooth, spread over the inverted bases using a teaspoon, scatter icing sugar over the lids, place on the biscuits. Use blackcurrant jelly instead of mandarin jelly.